For America, the mid-nineteenth century was an era of vast expectation and expansion: the country dreamed big, craved new lands, developed new technologies, and after too long a delay, finally confronted its greatest moral failure: slavery. 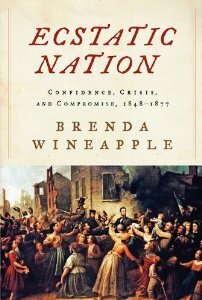 The award-winning historian and literary critic Brenda Wineapple explores these feverish, ecstatic, conflicted years when Americans began to live within new and ever-widening borders, both spiritual and geographic; fought a devastating war over parallel ideals of freedom and justice; and transformed their country, at tragic cost, from a confederation into one nation, indivisible. Populated by idiosyncratic, unforgettable characters like P.T. Barnum, Walt Whitman, George Armstrong Custer, Elizabeth Cady Stanton, and Jefferson Davis, Ecstatic Nation moves from the zealous debates about slavery through the devastation of the Civil War. It explores the terrible complexities of Reconstruction and the fledgling chance that women would share equally in a new definition of American citizenship. Breathtaking in sweep and scope, it traces the lust for land and the lure of its beauty from a frenzied rush to riches to the displacement of Indians. And it takes us forward—toward the promise of a more perfect Union for all. A masterful synthesis of political, cultural and intellectual history, Ecstatic Nation is a spellbinding tale of America—its glory and greed, its aspirations and humiliations—in this exhilarating and momentous period. © 2013-2019 Brenda Wineapple. All rights reserved.